The aroma of wood smoke mingles with that of ham and spices and floats through the heart of Dandenong. It's an aroma Bert Glinka grew up with. "I used to come to Uncle's Smallgoods with my parents," says Glinka. "It's one of my earliest memories." The son of Polish immigrants and an immigrant himself they would bring him to this butcher shop not far from Dandenong station and what used to be the town's rough biker strip. "Here they would buy ham, krackowska (an air-cured sausage originally from Krakow) and wiejska (country style sausage) from the owners Marian and Nora Poprawski he says. The couple were a bastion of Polish food culture in Dandenong and were making all the smallgoods the local Polish community knew back in the mother country. Young Glinka grew up, did well at school, and after leaving university became a marketing and communications officer. He met Brendan D'Amelio when he started dating his sister. 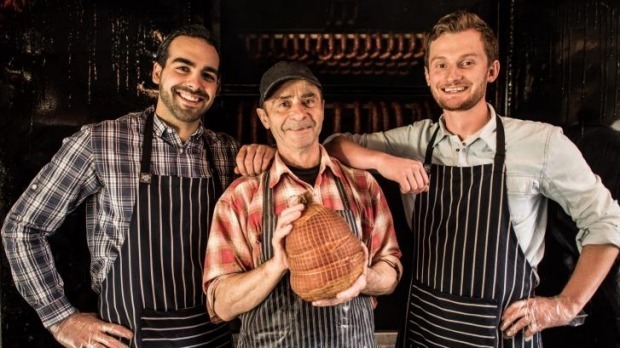 D'Amelio worked in marketing and, with an Italian heritage, they shared a love of cured meat. The pair also shared an entrepreneurial streak and founded a small business called Yumski where they would sell kranskys (which they bought from the Poprawskis) at festivals. Their little side business did well. The brothers-in-law found they worked well together and they planned for something bigger. Then Glinka had a conversation with the Poprawskis in which they revealed they were getting too old and tired to maintain the pace and hard life of making smallgoods. "That was when Brendan and I approached them to buy their business," says Glinka. The young men were put through the hoops to ensure not only did they have the resources to take on the business but the passion to become the guardians of the food culture. Something in their nature convinced the elder sausage makers and just over 12 months ago the duo were handed the keys to the business. They also took on the responsibility of the staff, many of whom had been working with Poprawskis since they started in the early 1990s. One of them, Michal Lasota (pictured centre), is one the most important members of the smallgoods making team. "The Polish people would look at Brendan and me and call us 'mlody wujek', which means 'young uncle'. Glinka and D'Amelio have since done a few minor renovations to the deli and also took over the shop next door, opening it as Young Uncles Food and Drink in March this year. The deli is still the meeting place for the local Poles with English definitely the second language. The cafe next door attracts a younger crowd of local hipsters attracted to $6 jaffles made with smoky bacon or polish sausage with cheese and tomato, and $10 Cuban sandwiches made with ham, pulled pork, red cabbage and pickles. In honour of their kransky festival marquee beginnings the men celebrate each Wednesday with $6 weiners – a smoked sausage in a brioche bun. "This is Dandenong. We have to be cheap," says Glinka. "But the people around here know their quality." Uncle's Smallgoods is hosting a special event to mark The Age Good Food Month. The Smokehouse to Plate – Smallgoods Appreciation Club is a chance to learn smoking techniques and taste different smallgoods. Thursday, November 20; $60; phone: 9793 0135. Uncle's Smallgoods: 123 Thomas Street, Dandenong, 9793 0135. Open: Tuesday, 9am-4pm; Wednesday-Thursday, 9am-5pm; Friday, 8am-5pm; and Saturday 7am-1pm.